The 10th anniversary of living or working anywhere is something that should be marked and celebrated. 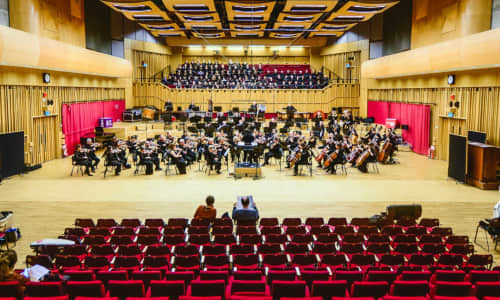 In the case of BBC Hoddinott Hall, when you consider what a huge change its opened doors in 2009 signalled for the BBC NOW family, ten years on from this moment is certainly something deserving of its own special concert. After all, following the big shift of operations from the BBC’s Broadcasting House in Llandaff, this is a building which has become the busy workplace and performance space for over 200 people – orchestra, chorus, management – hosting many 1000s of hours of rehearsal, recording, public performance and desk-based administration. We wanted to reflect a number of different things in this 10th anniversary programme, but in essence it looks back and it looks forward and showcases what the performance space has represented most of all, for its very grateful residents. It’s a place where new music has flourished, and where all kinds of music has reached audiences with a clear but visceral impact. The first essential component, as with the opening concert in January 2009, had to be a work by Alun Hoddinott. Taliesin was his last completed work, and was premiered by BBC NOW at the Swansea Festival a few months after this hall’s opening, in October 2009. 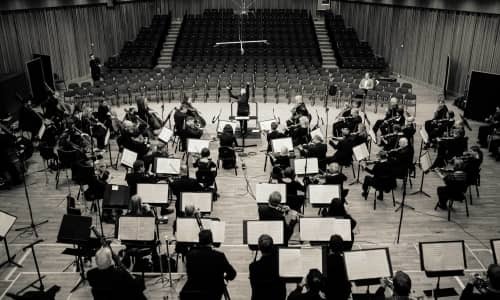 Given that Hoddinott Hall has been the vessel for so many world premieres in its first decade, it also felt important to feature a brand-new piece in this concert. Kenneth Hesketh’s Uncoiling the River, commissioned jointly by BBC NOW and the Royal Liverpool Philharmonic Orchestra, features solo pianist Clare Hammond. It sets her the challenge of not only playing the Steinway conventionally, but with ‘friction mallets’ (apparently, a ‘superball with a vibraphone shaft inserted’) and felt gloves – not to mention playing a set of ‘desk bells’ for an Asian-influenced passage towards the end. Tantalising. Why do we change conductors at half-time? Well, we thought this concert programme could represent in a very tangible way how the classical music world has changed in the last ten years. Back in 2009, female conductors were quite a rarity. Now, happily, they are much less so, and BBC NOW is pleased to be working regularly with many exceptional female conductors. Martyn Brabbins has been a regular and much-admired visitor to Hoddinott Hall in the last decade and will continue to be in the future. New Zealander Holly Mathieson makes her debut with us tonight and represents an exciting new generation of female conductors who will surely be part of our orchestral landscape in the years and decades to come. Championing female composers, too, is something that BBC NOW has done with enthusiastic conviction in recent years, so it seemed important to feature two in this programme. That they are both Welsh, and representing two distinct generations, makes it an even better fit here we feel. Sarah Lianne Lewis’s work is one of the great finds of our hugely important Composition: Wales programme (which returns later this month), and Rhian Samuel’s Brass Express allows us to showcase the talents of one of our distinguished principal players, In this case trumpeter Philippe Schartz. Finally, Holly Mathieson’s choice of Andrej Panufnik’s Sinfonia Sacra is all about showing off the orchestra in this space. A trumpet fanfare surrounds the rest of the orchestra at the start, and this remarkably sonorous, appealing work sets off from there to revel in the way an orchestra playing live can pin an audience to the back of their seats. That seemed a good way to finish a programme that, in essence, thanks a building for being what it is to the musicians and listeners whose privilege it is to enjoy it.